This big, metal Sausage Gun is the way to go if you intend to make larger quantities of bait or want to use baits that start off as firmer pastes. The aluminium barrel has a higher volume capacity and the trigger mechanism, plunger and push cam are all ‘beefed up’ to cope with regular use and the tough metal barrel has a much larger capacity than the standard Sausage Gun. This makes extruding out higher volumes paste much easier and quicker, without refilling the gun so regularly. Different base mixes go through bait guns very differently. Therefore, you will often need to customise the nozzles to suit individual bases, as some expand slightly after extrusion. As a rough guide; finished sausages of boilie paste should be 80% of the diameter of the finished boilie, e.g. 20mm boilies require a 16mm sausage. 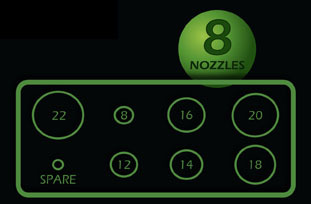 Comes complete with 8 different sized nozzles which can be trimmed if required.